In Computer parlance, Squid is a proxy server and web cache daemon. It has a wide variety of uses, from speeding up a web server by caching repeated requests; to caching web, DNS and other computer network lookups for a group of people sharing network resources; to aiding security by filtering traffic. In animal World, more specifically related to marine life, Octopus is a cephalopod mollusc of the order Octopoda. Octopuses have two eyes and four pairs of arms and, like other cephalopods, they are bilaterally symmetric. An octopus has a hard beak, with its mouth at the center point of the arms. Octopuses have no internal or external skeleton – and are considered to be most intelligent and behaviorally flexible of all invertebrates ! The octopus inhabits many diverse regions of the ocean, including coral reefs, pelagic waters, and the ocean floor. They have numerous strategies for defending themselves against predators, including the expulsion of ink, the use of camouflage and deimatic displays, their ability to jet quickly through the water, and their ability to hide. An octopus trails its eight arms behind it as it swims. Squid are cephalopods and have a distinct head, bilateral symmetry, a mantle, and arms. Squid, like cuttlefish, have eight arms arranged in pairs and two, usually longer, tentacles. Squid are strong swimmers and certain species can "fly" for short distances out of the water. Though both Octopuses and Squids fall under cephalopods - they differ in their physical characteristics, habitat and behaviour. An octopus has a round head and a mantle along with eight arms. Squids have a triangular shaped head, a mantle and eight arms. he arms of a Squid are endowed with hooks and/or suckers or sucker rings. The tentacles are arranged in pairs. In 2010, the whole of Spain erupted with joy as their National side reached the FIFA WC final for the first time ever beating the odds on favourite Germany by a solitary goal. Before the first kick, Germany’s fate was sealed at Oberhausen – it was the divination of - Paul the Octopus, a two-year-old who correctly predicted the results of major German international football matches especially in the 2010 FIFA World Cup. The ungainly looking creature was hatched at the Sea Life Park in Weymouth, England but resided at Sea Life Aquarium in Oberhausen, Germany. Before German international football matches, Paul was presented with food in two identical containers; one container marked with the flag of Germany and the other is marked with the flag of Germany's opponent. In each instance, Paul's choice of food was interpreted as his predicted victor. Paul reportedly chose the winner correctly in five of Germany's six UEFA Euro 2008 matches, predicting that Germany would win every match except a loss to Croatia. After its prediction of loss of Germany, some were calling that it be put to menu and Spanish PM once jokingly said that he would send a team of body guards to protect. When it died, the flags were kept at half-mast at the Sea Life Centre in Germany, the keepers wore black armbands and people stood in queues to sign the book of condolence. Now the dead animal is in news again as it made people wait impatiently. 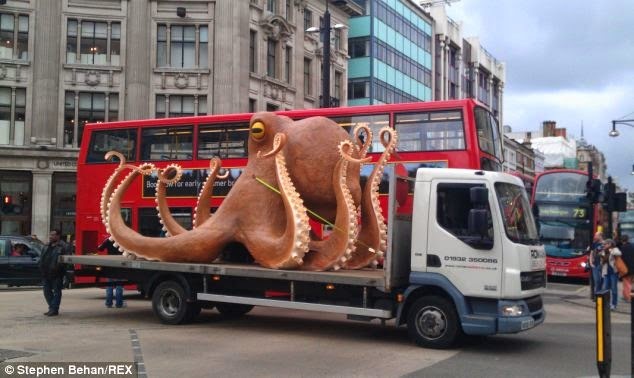 Daily Mail and other newspapers reported that a giant replica of a prescient octopus made suckers of commuters in Britain’s capital when the truck carrying it broke down, blocking one of London's busiest intersections in the morning rush hour. The cephalopod statue was being towed on behalf of a betting company that had used it as a prop in a promotional campaign ahead of this month’s soccer World Cup when the truck apparently broke down. 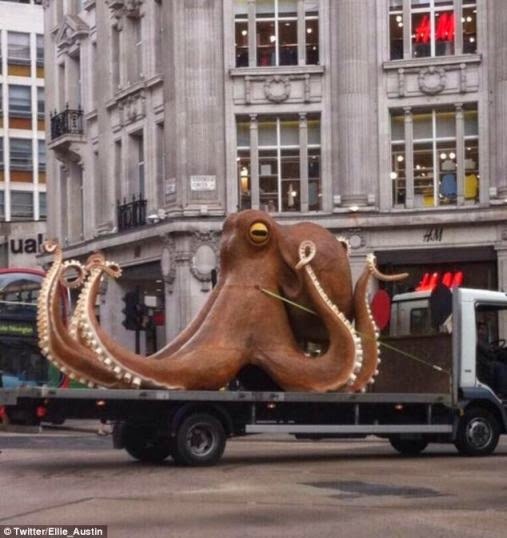 The truck carrying the replica of Paul, the Octopus, blocked the intersection of Oxford Street and Regent Street – two of London’s busiest shopping thoroughfares – at about 8.30 a.m. local time snarling traffic and forcing the diversion of the city’s red double-decker buses. Angry Londoners took to Twitter, saying the breakdown had been deliberately staged to attract publicity. The company, Betfair, said the incident was unplanned. “We’d like to apologize for any inconvenience,” it said in a statement.